BREAKING NEWS: STV news has learned that Michael Martin is standing down later today as Speaker of the House of Commons. STV news has learned that Michael Martin is standing down later today as Speaker of the House of Commons. It is understood that Mr Martin will likely make an announcement to MPs in Westminster at 2.30pm. The political future for the MP for Glasgow North East now hangs in the balance and a by-election could follow. STV news political editor Bernard Ponsonby broke the story at 10.15am on Tuesday. He explained the complexity of Mr Martin's decision to stand down, saying: "This is an awkward position for the House and indeed the Prime Minister to be in. And it opens up the possibility of a squabble between the two main parties. "The last two Commons Speakers have come from Labour. Many in the house will want a Speaker from outwith the governing party but that could be vetoed by Labour MPs if the succession becomes a matter of party politics. "Also complicating this is the Speaker's position as a constituency MP. 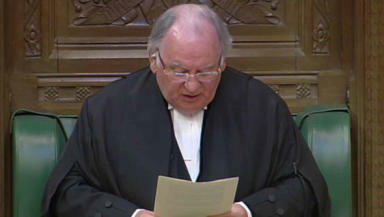 Michael Martin was elected as 'The Speaker'. Should his resignation from this position lead to a by election in his Glasgow North East constituency? That could become clearer later in the day." The Speaker was due to hold emergency talks on the reform of MPs' expenses at 4pm. That meeting may continue, but it is unclear whether Mr Martin will attend. Mr Martin had summoned Prime Minister Gordon Brown and other party leaders for the talks as politicians grappled to contain the crisis that has erupted following the disclosure of details of MPs' second home claims. The Speaker's own future was left in the balance following extraordinary scenes in the Commons on Monday when a series of MPs rose to demand he stand aside or submit to a vote of no confidence. Despite saying he was "profoundly sorry" for his part in what had happened, he showed no indication that he was prepared to go. The UK Government had resisted pressure to allow a Commons debate on a motion of no confidence in Mr Martin tabled by the Tory backbencher Douglas Carswell. That motion had been backed by 23 MPs by this morning. Speaking in Westminster on Monday, he said all members bear responsibility for what had happened and they all must work to restore the trust of the voters. He added: "We all bear a heavy responsibility for the terrible damage to the reputation of this House. We must do everything we possibly can to regain the trust and confidence of the people." He urged all MPs not to submit expenses claims for approval until interim reforms had been agreed and said an early day motion calling for him to be replaced was not "substantive". Mr Martin also refused to say whether he would be stepping down before the next general election. His statement did little to quell anger among MPs. 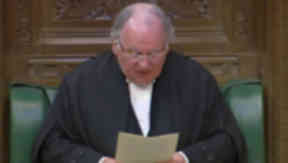 Conservative MP Richard Shepherd urged that the motion of no confidence in Mr Martin should be debated, but the Speaker said that was a matter for the UK Government. Liberal Democrat leader Nick Clegg was the first party leader to add his voice to those calling for him to go, saying Mr Martin had "dragged his feet" in reforming the system. Mr Martin, MP for Glasgow North East, angered critics by trying to block publication of MPs expenses and failing to push reforms of the system. He came under renewed fire last week for rebuking MPs who questioned his approach. Previously, he had faced criticism over his family's claims for allowances, as well as facing high-profile questions over why police were allowed to search Conservative MP Damian Green's office without a warrant.